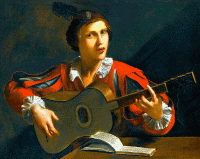 The small 4 course renaissance guitar was a minor instrument whose repertoire was very much in the style of the lute or vihuela – it had yet to gain its own distinctive voice. There is evidence for the addition of a 5th course in France, Spain and Portugal in the middle of the 16th century – and, indeed, the earliest surviving guitar is a small 5 course made by Belchior Dias of Lisbon in 1581 – but that fifth course did not begin to gain wide acceptance until the last decade of the 16th century and into the first decade of the 17th century, by now the beginning of the baroque period, when the guitar also radically increased in size and therefore lowered its overall pitch. From 1600 and through the 17th century, a few players still preferred the small 4 course guitar, or a 5 course guitar made in the old, small size (as was the Dias); but the new size became the popular choice, and it is this larger-bodied instrument that we now call the ‘baroque guitar’ for the period roughly 1600-1750. There was a huge variation in shape – thin bodies, wide bodies, tapered bodies, various lengths of necks – and some variation in tuning. The first three courses were all tuned in unisons (sometimes with a single first string) – e' b g – while the fourth course was either strung in octaves with the upper octave positioned so it is played first on the downstroke – d d' – or both strings were an octave above the modern guitar, at the same pitch as the third fret of the second course – d’ d’. Likewise the fifth course could also be a mix of the two octaves with the upper octave played first on the downstroke – A a – or two strings of the upper octave, playing the same note as the second fret of the third course – a a. These combinations gave the possibility of three different tunings (fourth and fifth course both in octave pairs; fourth and fifth course both at the upper octave; fourth course in an octave pair and fifth course both at the upper octave), according to the preference of the composer or player, so if a guitar player today wants to have a really accurate baroque guitar repertoire, then either three baroque guitars or a lot of restringing is called for! The larger size and the extra course marked a fundamental shift in the way the guitar was played. A new simplified style of playing was created for the guitar – the strum or rasgueado – consisting entirely of chords played rhythmically using various combinations of fingers or fingers and thumb. This is the entire idea behind the first tutor for the instrument, The Five Course Spanish Guitar, by Joan Carles Amat (also Juan Carlos Amat), published in Barcelona in 1596. The author worked as a physician and was a pastime musician who created a new shorthand for chords using a series of numbers. He clearly saw the guitar as an instrument that could be easily picked up by anyone, a notion reinforced by the very simple principles in his book. His idea was further developed by Italian singer and composer Girolamo Montesardo’s seminal Nuova inventione d'intavolatura (New invention of tablature) of 1606. For this book, Montesardo created his own shorthand for chords, alfabeto notation, based on Amat’s scheme but using letters instead of numbers, which was to become standard for the new rasgueado repertoire. Thus we see the very beginning of modern guitar style, for four key reasons: (1) Guitarists, in common with lutenists, were now using a ‘thumb outside’ right hand position, much more like the hand position we’d recognise today. No longer was the hand parallel to the strings with the thumb placed inside the hand for a smooth, full sound. Now the hand was at an angle to the strings, with the thumb completely outside of the hand (see comparative illustrations), to enable the strumming style and give a sharper, more trebly tone. (2) This is the first evidence of a style we’d most associate today with rhythmic flamenco dance music and song. (3) The rasgueado style was also used regularly to accompany song in a way that was completely different to the renaissance but not too far removed from the strummy guitar-led pop music of the 20th century. (4) The instrument was now more the size of the modern guitar, with nominally the same pitch as today’s guitars and a tuning which, simplified into single strings rather than courses using octaves, gives us the tuning of the modern guitar. The new style made the guitar popular among dancers in the theatre and the street; and with singers, no doubt because it was now an instrument with a style that could be mastered relatively easily, compared to the lute. But for this reason the guitar had a terrible reputation among lovers of the lute, who thought the guitar crude and easy; and among commentators on religion and morality, who were horrified at the lewd and suggestive dances the guitar was now used to accompany. By 1630 the ‘mixed’ style had developed – battute e pizzicate in Italian – a combination of strummed chords and individually plucked notes, as first shown in Italian composer Giovanni Paolo Foscarini’s Il primo, seco[n]do, e terzo libro della chitarra spagnola (The first, second and third book of the Spanish guitar). It is repertoire in this style that you’ll hear today by players of baroque guitar music, as pure rasgueado is now of limited interest at best to listeners. The new ‘mixed’ style made good use of the stringing on the fourth and fifth courses to create an effect known as campanelas, or ‘little bells’. This involves playing consecutive notes on different strings so that the sound of each note continues to ring as the next one starts, like a peel of bells. The baroque guitar’s re-entrant tuning – where strings are out of the usual pitch sequence of high to low and so have to re-enter the sequence – makes campanelas much less effort on the left hand and so technically much easier to achieve. The popularity of the guitar spread across western Europe and to all levels of society, from rural dancers and singers right up to royalty. Though, for reasons given above, it was not universally celebrated, the fact that serious composers with good connections were writing music for it certainly helped its status. Chief among these were Francesco Corbetta (c. 1615–1681), an Italian attached to the Court of Carlo II, Duke of Mantua; Gaspar Sanz (1640–1710), Aragonese composer, Professor of Music at the University of Salamanca, Spain; and Robert de Visée (c. 1655–1732/1733), lutenist, guitarist, theorbo and viol player at the court of French Kings Louis XIV and Louis XV, and singer and composer for lute, theorbo and guitar.